This beautifully appointed, custom-built John Cannon home in the highly desirable, gated community of Silver Oak has been designed with today’s lifestyle in mind. Located on the premier cul-de-sac, this casually elegant, open and airy home is perfect for entertaining. Large rooms feature tray ceilings, extensive crown molding, built-in cabinetry and easy-care neutral tile flooring. The kitchen is stunning with wood cabinets, granite counters, breakfast bar, island with food prep sink, Sub-Zero refrigerator and high-end appliances with matching cabinet fronts, an oversized Wolf oven, warming drawer, a Miele coffee system, concealed walk-in pantry, plus a crumb-catcher vacuum system. In the adjoining family room with great views of the pool area, a double-sided gas fireplace creates a focal point and is shared with the bonus room with an adjoining suite, creating the effect of a guest apartment. Two additional bedrooms offer privacy for everyone. The master suite is oversized and, like all of the other bedrooms, enjoys a built-in window seat with storage. The generous, sumptuous bathroom and two walk-in closets round out this perfect picture. Nearby is the home’s office with hardwood flooring, built-in cabinetry and desk system. The expansive screened lanai encloses the pool and spa and includes an outdoor kitchen and covered areas bordered by lush landscaping. Tile roof, circular paver drive. 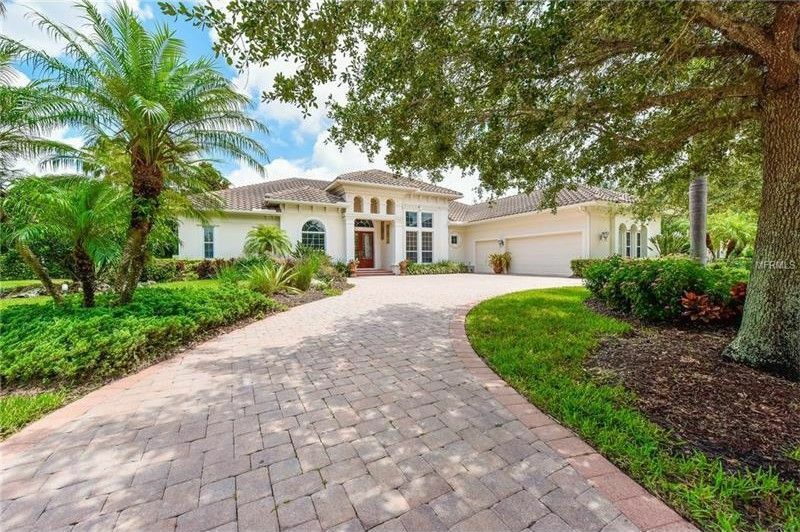 Exclusive Silver Oak is 24-hour guard-gated, located in the heart of Palmer Ranch near the beaches of Siesta Key.